If you’re looking for an unforgettable stay with a warm atmosphere, spend New Year in our charming hotel. 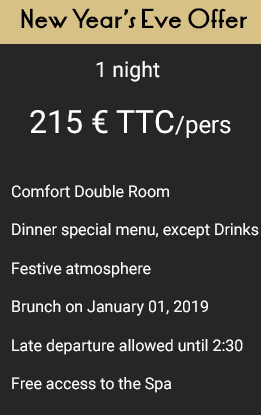 Offer available from december 31, 2018 to january 1st, 2019. Take advantage of our special New Year’s Eve offer to relax in our spa, which is open to the peaks of Mont-Blanc. Enjoy a relaxing moment in our wellness area with a water pool, jacuzzi, hammam and fitness center. Come and celebrate the New Year’s Eve in our restaurant with special menus and incredible festive atmosphere. The reservation is not cancellable, not changeable and not refundable. Pre-payment at booking. Offer not valid in single room. Rates include all taxes, excluding tourist tax and departmental taxes.